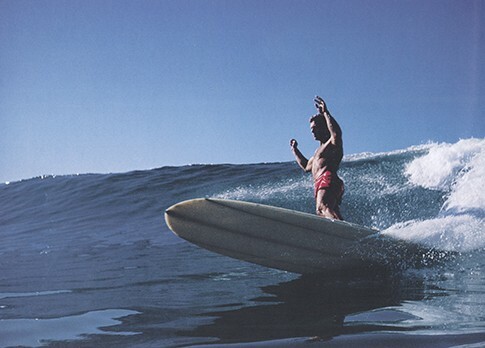 Phil Edwards "1995 Surf Pioneer"
Credited with changing the surfing style of an entire generation, Phil ushered in the more functional style of smooth, graceful moves and kneedrop turning that has since become known as the classical California surfing style. 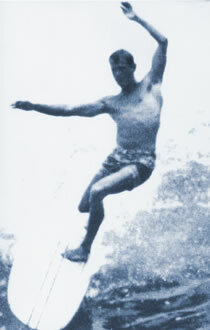 Edwards was one of the first people to ride the storied "Pipeline" on Oahu's North Shore in the early 1960's. He became one of the most noteworthy board shapers, and got back into shaping about five years ago amidst the resurgence of longboarding. Phil's introduction to surfing was rather matter of fact. He was an avid model boat builder and his half-brother built him a paddleboard so he could chase his model boat around Los Alamito Bay. 50 years later, he's still into model boats...and real ones! A great portion of his professional career was spent building catamarans for Hobie, though he had never actually owned one until just this year! He also owns a motorboat which he uses to pursue his life-long love of scuba diving. He likes the solitude of scuba and compared it to surfing in the 1950's and '60s, "The big appeal of surfing for me was the wilderness aspect. It used to be, I'd be the only person at Trestles. You'd get a good ride and there would be no one to see it!" Married over 20 years, he now resides in Capistrano Beach.